I consider doing the laundry as one of the most time consuming household chores. It just takes so much of our precious times when we have better things to do (especially for someone like me who rarely has extra time as I juggle law school and motherhood). But still, someone has got to do this task. Luckily, modern Filipino families are now given such opportunity to turn this tedious task into a fast, convenient, time-saving and affordable one. During a whole day activity last Saturday, families of Barangay Holy Spirit along Commonwealth Avenue in Quezon City trooped to the Barangay Holy Spirit covered court for the “Midea Lab-A-Fair”. These families and members of the press were the first to experience what Midea washing machines, particularly the Midea One-Touch Washing Machine, are all about. 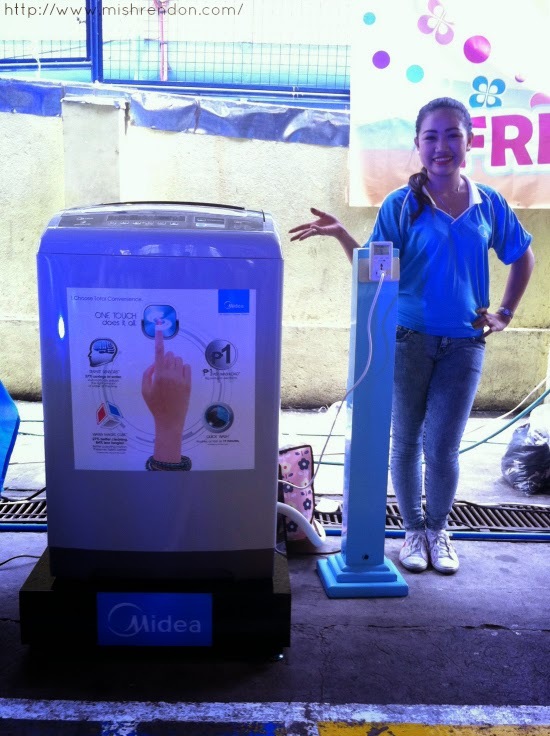 The Midea Lab-A-Fair showcased the helpful capabilities of the Midea One-Touch Washing Machine in enabling families to take charge of their laundry. With just one push of a button, they can now wash, rinse and dry their laundry and ensure better efficiency and delicate handling of their wash load. Imagine what you could do with the time you saved from doing the laundry manually. 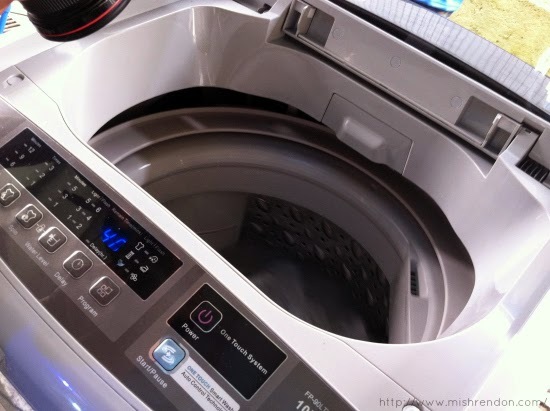 What differentiates Midea from other kinds of washing machines is that the Midea One-Touch Washing Machine boasts of one-touch button features which provides 16 percent better cleaning of clothes. It has a 3D Waterfall feature that creates strong water current inside to enable water and detergent to penetrate the fabric more efficiently. 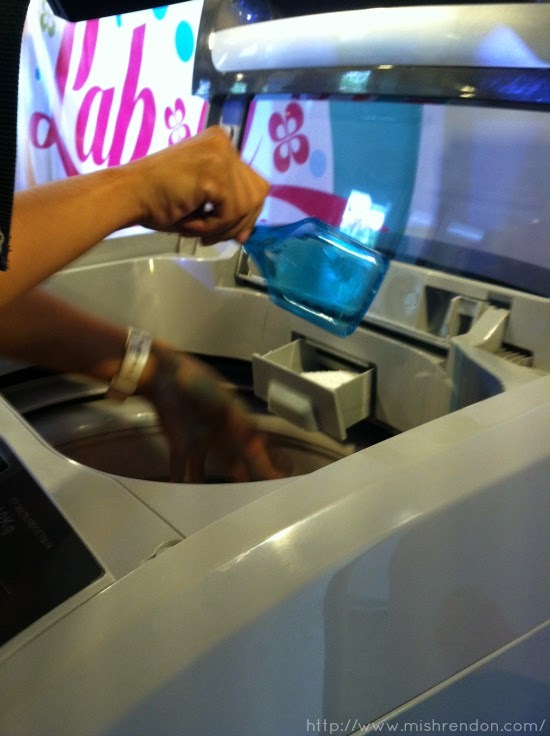 Meanwhile, the Water Magic Cube feature saves time by doing away with untangling of clothes, and the Smart Sensors checks that the right amount of water is loaded in every wash.
A total of 10 Midea One-Touch washing machines were installed for the Midea Lab-A-Fair, with eight positioned at the “One Touch Laba Station” at the court, and two more units at the Demo Truck parked nearby. Each washing machine unit has a power meter installed to showcase its P1 per wash load capability. The Midea One-Touch washing machine not only helps you regulate the amount of water that you use, but it also helps you regulate your electricity use. 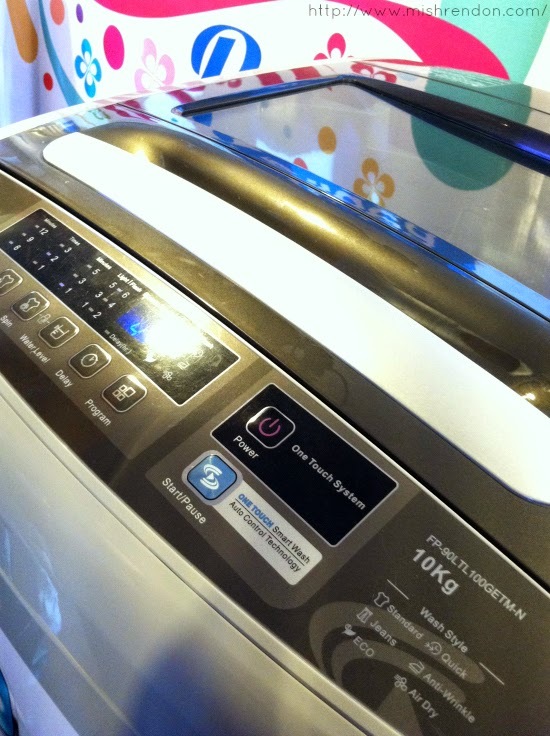 Of course, we did not miss our chance to try out the Midea One-Touch washing machine for ourselves! .. then just click Power and Start! The free laundry activity allowed 100 registrants to do the free One Touch trial, with a maximum of eight kilos of laundry per person. To participate, barangay residents first went to the weighing stations to determine the weight of their laundry. Then their laundry was then placed in a special bag complete with a number tag that served as the resident’s queue number for the One-Touch Laba Station. While waiting for their laundry to finish, a handful of Midea Specialists talked about the innovative special features of the Midea One-Touch Washing Machine. But the Midea Lab-A-Fair was not just about washing clothes for free. 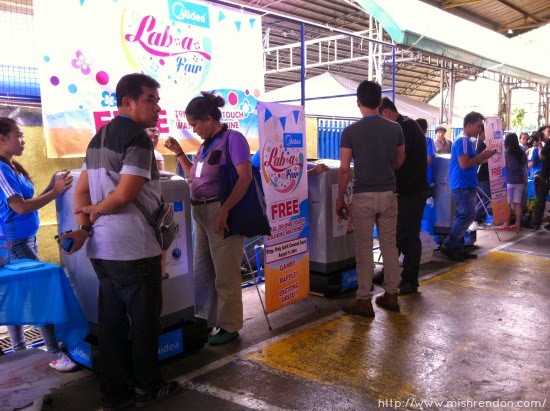 As an added treat to Barangay Holy Spirit residents, special activity booths were also set up to highlight the washing machine’s features and to deliver more fun and excitement. 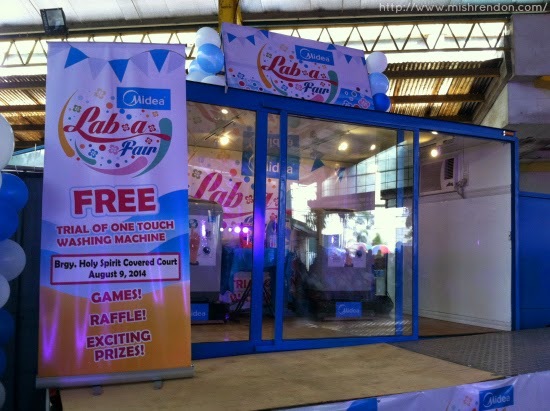 The booths featured entertaining games such as “PISO Roleta Game,” “Magic Cube Game,” “Water Control Game,” and a photo booth where residents had their photos taken and got a free souvenir from Midea. A special entertainment show hosted by Gelli Victor and Gabe Mercado featured thrilling games like the “One Touch Game” and the “Pera O Batya Game.” I myself even joined the games and won a selfie-pod. :p In the raffle, lucky residents took home special prizes like Midea Laundry Packages and brand-new Midea Microwave Ovens. 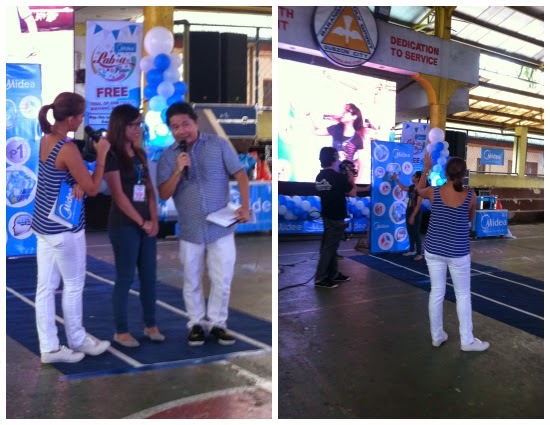 And here's me winning a brand new Midea One-Touch washing machine! No more excuses in not doing my own laundry. 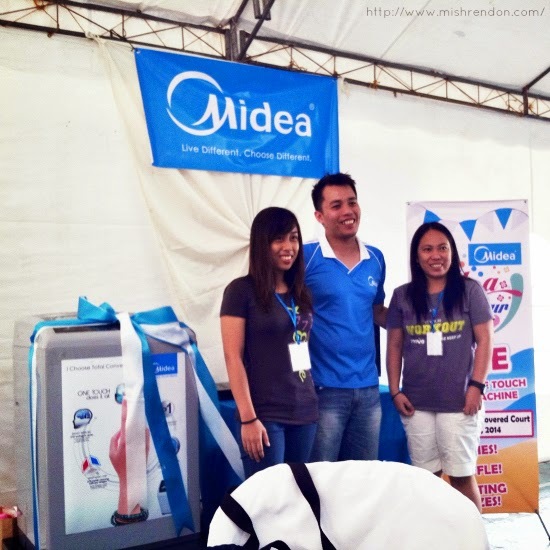 :p Thank you, Midea!!! Here with me is Mr. Julio Sulit of Midea. Midea, one of the world’s most trusted appliance brands, is distributed in the Philippines by Concepcion Midea, Inc., a joint venture of the country’s big names in quality home appliances, Concepcion Industrial Corporation and Concepcion Carrier Air Conditioning, with the objective of bringing quality and innovative home appliances to consumers in the Philippines.